In England, is it raining? Is it pouring? Are you wet? Are you cold? Miserable? Well, how about a change? Then, how about a visit to a warm tropical beach with palm trees swaying in a gentle soft breeze, pure white sands, and a gorgeous blue-green sea with gentle waves lapping the deserted shore? It is not a dream but a real place! And what about those pure white sands? Well, on tropical islands, the sands are usually carbonate (limestone) sands composed of many different skeletal remains. But on this particular island, things are different. Here the white sands are “ooids”, and the island is one of the three Bahamian Joulters Cays, off the northernmost tip of Andros Island. The ooid deposits are in large mobile shoals located between the Cays, or islands. The shoals here are a series of bars on a large shallow sand flat of about 400 km2 in size. The islands are also composed of cemented ooids (called oolite) forming sand ridges, about 3 m high and 50 m apart. Great, you say, but what is an ooid? An ooid is a small (ranging from 0.25 to 1 mm in diameter), round, or oval, concretion, resembling fish roe, with many successive concentric layers about a central nucleus. The nucleus is usually a foraminifer, algal particle, or a shell fragment. The ooid is formed chemically in warm agitated shallow water by bacteria and algae precipitating aragonite (a form of calcium carbonate). Under the microscope, in thin section, the ooid is a thing of beauty. The tangential aragonite crystals show a pseudo-uniaxial cross under crossed-polars. Micrographic techniques in the examination of Joulters Cay ooids at ×340 magnification. Ooids are embedded in blue epoxy resin. Top left – polarised light in air: ooid banding and the outer band appears dark; central nucleus more obvious; interior banding distinct with some indications of past signs of initial spalling. Top right – polarised light under oil: ooid banding and the outer band appears even darker; blue plastic is clearer and lighter; central nucleus less distinct; interior banding less distinct with less clear past signs of initial spalling. 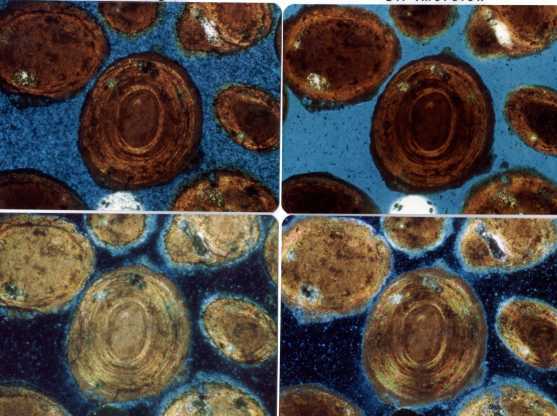 Bottom left – crossed polarised light in air: ooid outer banding can be determined as freshly deposited micritic cement; ooid interior more distinct and centre ooid interior banding clearly showing past signs of initial spalling. Bottom right – crossed polarised light under oil: the psuedo-uniaxial cross can be clearly seen; outer micritic layer very distinct; interior banding darker with less clarity of past signs of initial spalling. Oolite, rock composed of ooids, is found throughout the fossil record, from the Pre-Cambrian of Antarctica to modern-day Bahamas and Arabian Gulf. So, sands on a tropical island can be unique. Next time you visit a warm tropical island beach, it might be worth your while to bring a microscope rather than a bucket and shovel. Oh, well. Back to reality.